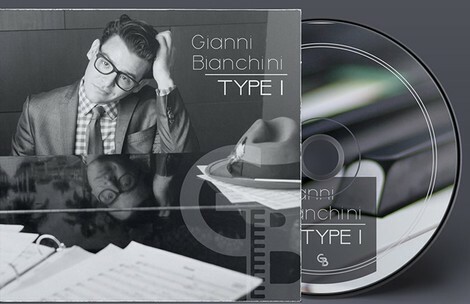 The Florida based pianist Gianni Bianchini has a new album to be released on Feb 21, 2017 titled Type I. The title is reference to his recording debut and the fact that he fights with Type I diabetes which has been an influence on his life and so also his music. Perhaps his condition has given the gifted pianist a sense of urgency and if so that urgency has colored his music. On this album, he is joined by bandmates Brandon Guerra on drums, Richard Mikel on bass. The liner notes indicate Jason Marsalis plays percussion, although to my ears one would be hard pressed to know exactly where he plays. Bianchini has a deft touch and a joyful delivery that can be downright alluring. His trio runs through American songbook standards like Rogers and Harts' "My Romance" and "My Heart Stood Still," Julie Styne and Sammy Cahn's "Time After Time", George and Ira Gershwin's "A Foggy Day," Jerome Kern and Johnny Mercer's "I'm Old Fashioned," and others that are played with a sense of authentic respect, pristine clarity and astute modernism. The man can certainly swing on a melody with creative arrangements and a sense of time that is quite impressive. Check out his version of "Softly as In a Morning Sunrise." The band is tight and stirs up an impressive froth. Bianchini's playing is brimming with a vibrancy and attitude that is infectious. Bassist Mikel and drummer Guerra know how to dig deep and keep the music grooving. If there is one downside it is Bianchini's vocals. They leave a little to be desired. Though he sings adequately and with the same upbeat swagger of his piano, his voice just isn't nearly as musical or his delivery that compelling. The trio is much better served by the vocal talent of Karen Tennison who guests on "I Wish I Knew." Ms. Tennisson sings with a breezy ease, with words that float and scats that have a refined coolness. Mr. Bianchini's piano work on this one is very impressive. Mr. Bianchini takes on Bill Evan's bouncy "Peri's Scope," a challenging piece for any pianist, which he and bandmates pull off with marvelous aplomb. Mikel's buoyant bass and Guerra 's brush work are of special note. The cd ends with a Henry Mancini poignant composition "Two For the Road" with Mikel offering an arco bass opening. This is a successful debut by a fine pianist and a sympathetic rhythm section who know their history and mine the Songbook's possibility with vim, vigor and a sense of modernism.